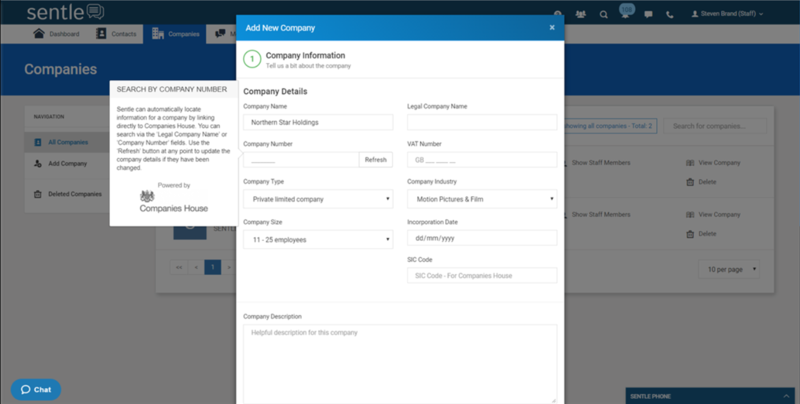 Adding a company to Sentle is achieved by navigating to the ‘Companies’ tab and selecting ‘Add Company’ from the left-hand menu. You will be presented with the following screen into which the company data can be added manually or via Sentle’s integration with Companies House. If you start typing in the ‘Legal Company Name’ field Sentle will match the company to related legal company names within Companies House. Alternatively, if you want to search via Company Number you can. Use the Company Type, Industry or Size drop down menus to add any further details. A company description can also be added if required. Custom fields can be created for companies, the details of which will be displayed in the ‘Additional Information’ area. See the ‘custom selection for companies or contacts’ guide. To complete the form a telephone number or email address can be added. Companies can be tagged in the same way as contacts, making it easy to search and group companies together via the data included.